Who's your fashion role model? I wouldn't go as far as calling her my role model but I am lately loving Anna Dello Russo and her style and of course her wardrobe! 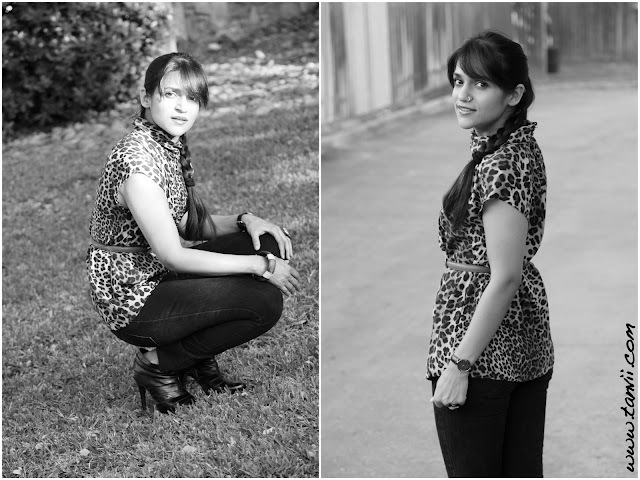 I would describe my style as - Forever Evolving! I get bored of dressing any one way. I can honestly say I have never worn the same outfit 'twice' exactly the same way. I always change it a little with belts, shoes, accessories, etc. However, I am VERY curious to know what my readers think. How would you all describe my style? Please let me know in the comments, will you? What's your favourite? Jeans, sunglasses or heels? What inspired you to blog about fashion? The first fashion blog I ever came across was of Jessica from What I Wore. That's what gave me the idea of of giving it a try myself. My FIRST outfit post was last year on Christmas. It was not until April that I started 'Fashion Blogging' regularly. Until then, it was all about my random thoughts, and fitness. None, in particular. I am not that loyal to any store or brand! What is your favorite fabric in clothing? Again, no one in particular. 90% of my wardrobe is all "Mall Brands" like Banana Republic, Gap, Urban Outfitters, French Connection but I do like few designers who are as unpredictable or colorful as me - Karen Millen, Ted Baker, Tory Burch, Stella McCartney, Vivienne Westwood to name a few. But I am not a slave to brands AT ALL! Emmmm ... No one in particular, really. I do not have any one role model but I do get inspired by movie stars, celebrities, magazine editorials and of course bloggers every now and then. Would you choose to buy something high quality or make it yourself if you could? I cannot 'make' anything as I have no clue how to stitch or cut. I think I would buy something high quality 'coz I need my clothes to fit me really well and somehow the 'ready-made' clothes work very well with my current body! I'm totally hooked to your 30 day agenda! well.. awesome post.. loved it.. as always! Great answers! I adore the leopard print with the side plait. 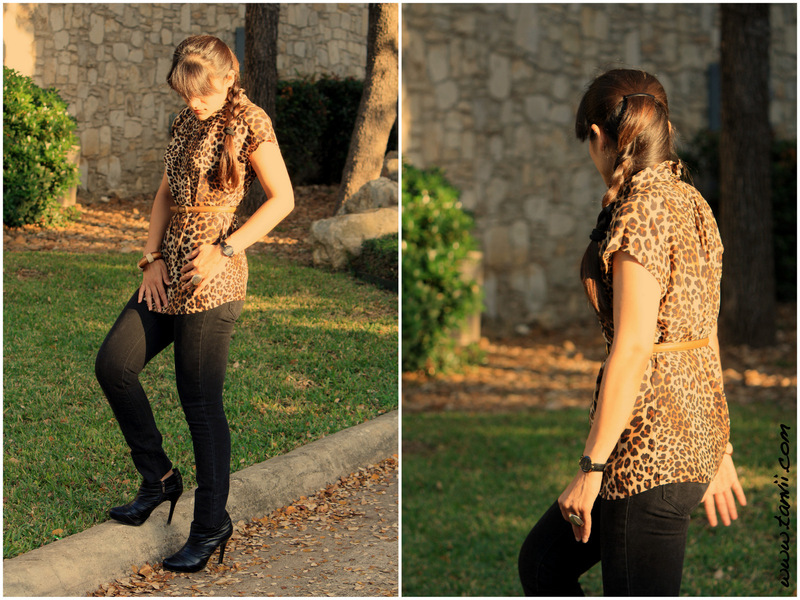 Love love love that leopard print top. It's such a beautiful item. Hehe, shoes are my favourite fashion accessory as well. I don't know where I'd be without them. 'Killing me softly' wud eb the caption for THE look :D Well, teh leopoard would kill you for hair like that! i like the top...and the plait ... wow. i need those heels ! Nice, I like your hair and top! I'm evolving too and start appreciating more fashion as I see it. your leopard top is really lovely ! Your outfits always have such panache! Like the sun effect matches to perfection with the leopard print! love the plaits! Damn neat wardrobe.. I loved getting to read more about you! what a fresh n clean look !!! like it ! all pics r lovely ! specially ur hairdo got my attention... its looking super cute on u ! love the leopared print and great answers too! Congrats on the tag! Love the leopard. Happy Thanksgiving! I agree with everyone else...that top is fabulous! It can be hard to pull off that print without looking a little, you know, trashy. But you don't!! You look classy! I love it! 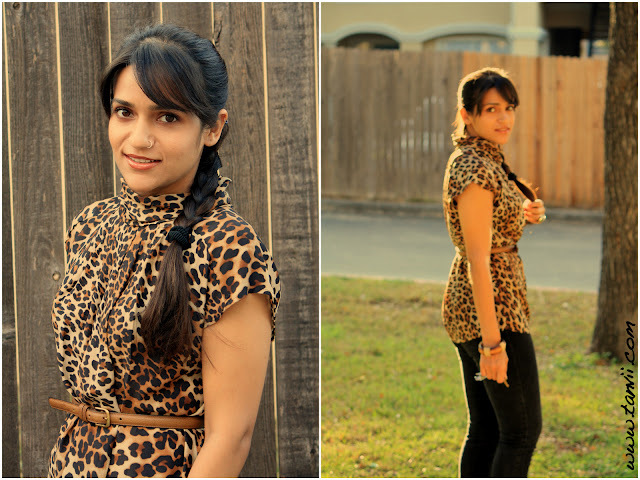 Yay for leopard! Someday I will work myself up from socks to a whole shirt...you wear it well, my dear. Your make-up looks so pretty! I love brown on your skin. You look so chic, simple, and beautiful. 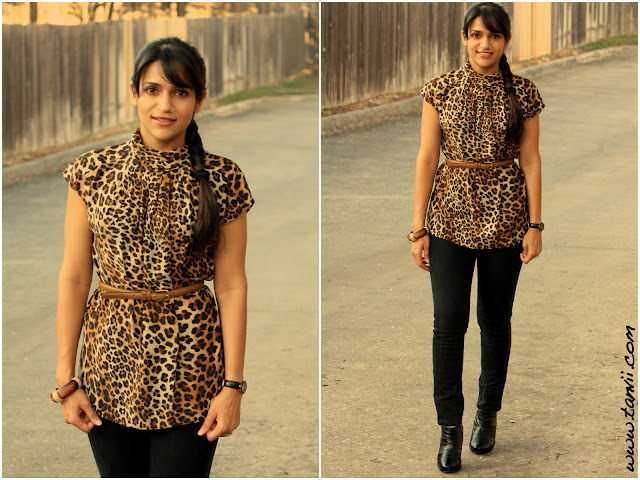 love the leopard top!! such a simple outfit but so fab! Hope u had a great thanksgiving! !